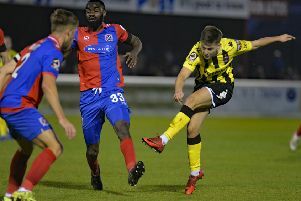 ddAFC Fylde face their third of four back-to-back home games this Saturday with the visit of Vanarama National League leaders Macclesfield Town, though the pace-setters hold no fear for in-form hotshot Danny Rowe. The 29-yea r-old crashed home his 15th National League goal of the season as the Coasters made it 13 points from a possible 15 since Boxing Day with last weekend’s 2-1 home win over Guiseley. Rowe said: “We don’t fear Macclesfield, even though they are top of the league. They like to play, so it should be a good game between two in-form teams. “We have nothing to lose as far as I’m concerned. We want to push on and get into the play-offs. “They come here top of the league and they’ll be confident of winning the game. Rowe admits he was resigned to frustrating afternoon in front of goal against Guiseley at the weekend – until his last-gasp 25-yard free-kick flew into the top corner! Rowe believes teams are now setting up to halt his free-scoring play-off hopefuls, who remain 11th in the table but are only three points behind Dover in seventh and have a game in hand on every team above them bar Wrexham. Rowe added: “It was getting towards the end of the game and I just thought it wasn’t going to be my day. “I had a half-volley go just wide, I’d hit the bar and I’d seen loads of shots blocked. “We got the free-kick 25 yards out and Sam (Finley) asked me if I was going to hit it. “I’d never turn down that kind of opportunity, so I hit it keeper’s side and thankfully it’s flown in. “We were on top in the first half but we came out after the break and looked like we really wanted to win the game. “They defended well but we were camped in their half and we had more than enough chances to win. “Guiseley set up similar to how Chester did a few days previously. Teams come here, particularly teams towards the bottom of the table, and set up to try to get a draw or wait for a mistake and nick something. “That’s what Chester did but we didn’t let that happen on Saturday. Manager Dave Challinor plumped for two frontmen at the weekend, with Jonny Smith joining top scorer Rowe in attack, and the top scorer believes the youngster showed promise. “Jonny is a very good player and he has bags of pace but he is only young, so he’s got things to learn,” said Rowe. “It’s a new partnership that we’ve not really looked at yet. “I think the manager put him up there with me because he can get in behind their centre-halves. “I’ve got my own goal targets going into every season and I set myself 30 this time around.